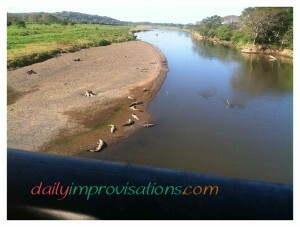 Crocodiles under a bridge some miles away from Quepos, Costa Rica. The rail was only up to my hips, so I could only look comfortably from a kneeling position. Thus, photo is taken through the railing bars. Then, our husbands admitted that they really did want to see a crocodile in the wild. When I had a moment alone with my husband, Wild Greg, I told him that I was working on having a cooperative attitude, but I couldn’t promise that I wouldn’t have a complete meltdown somewhere on the trip. He accepted the terms. He said I would have fun. The attire recommended by our husbands was a swimsuit covered by shorts and a shirt. I dressed in various shades of brown, deciding it was the best camouflage I had for both through the jungle or fording the anticipated muddy river. Even my two piece swimsuit was brown. Sunscreen was applied to already slightly pink skin on my shoulders and neck. The insect repellent was sprayed on top of that. A waterproof camera and sunglasses were the only other two things I took, but Wild Greg packed a bottle of water for us. Our friends traveled lightly as well. We headed out the back of the small resort property, finding some ramshackle buildings on a gravel road. 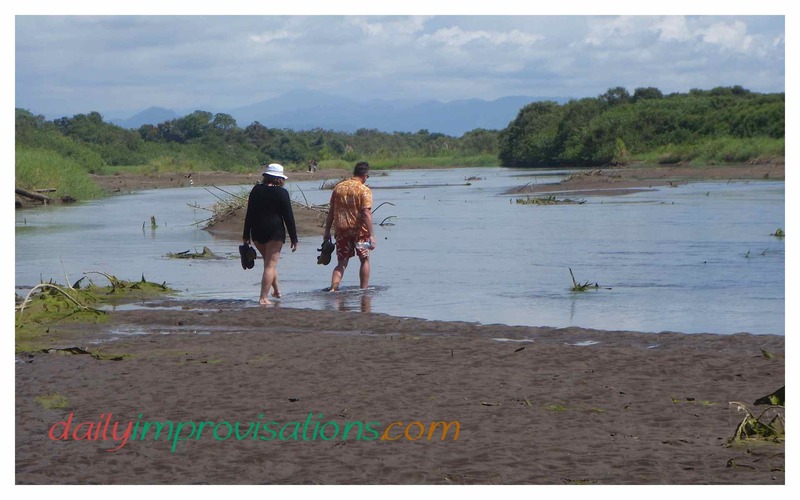 Within view, a few paces away, one end of the road disappeared into the wide, shallow river, Rio Cotos. A van sized canopied ferry boat with rows of empty seats was moored to the shore. It only operated at high tide, which was currently at 5 AM and 5 PM. At first the riverside was desolate. However, when a woman and two 10 – 12 year old boys showed up and began crossing the river, our two men joked that it detracted from their reputation as daring guides. On the other hand, seeing the much shorter boys casually up to their necks in water encouraged me. 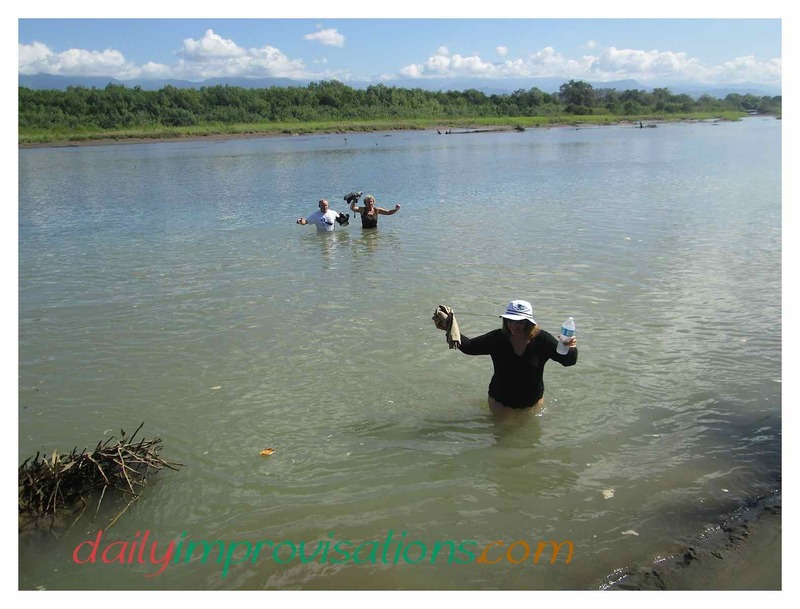 Observing that the water came up to the woman’s waist, it became apparent that I would be wading at least thigh deep. My shorts would get soaked and I didn’t fancy chaffing on the rest of the walk from wet clothing. Off came the shorts. It’s not like they were going to protect me from river creatures, plus, the added water weight might slow me down if I needed to run. I was the third person in our group to enter the water and we started across. The woman was obviously not used to seeing tourists cross with them and kept looking back suspiciously as we were crossing behind them. Soon, they veered left and exited the water in front of a diminutive blue house that sat at the river’s edge. The water was surprisingly clear. The riverbed here was mostly covered with smooth, brown pebbles. It was comforting to be able to see where I was walking, but I still had visions of crocodiles hiding in the abundant sand and vegetation on the banks of the river. Or they might come flashing toward me from a deep pool. I kept reminding myself to breathe. An offer was made to put me in the middle of the group, but Wild Greg correctly explained that I was fully convinced that the beasts would particularly seek me out no matter what, so no need for extra effort. They can smell who is the tastiest, after all. I simply could not make it to the other side fast enough. I was trying to walk calmly and avoid any splashing that made me look like a succulent fat fish. Then, the water got even deeper right before we reached the other bank. At that moment, it didn’t matter that I was now entering snake territory and an insect haven. I didn’t need any help scampering up the wall of mud into the bushes. At least I could see a small open path. My bare feet squished through the soggy trail. I watched where I walked, being extra careful due to the many stick-like protrusions. It looked like it was going to require some careful maneuvering, much like a secret entrance to a stash of treasure. It turned out that the “sticks” were new points of growth for the low growing plants. They bent easily and gave me some traction. I avoided the outer boundaries of the path, since there were some spider webs the diameter of a bathtub. Those spiders must have been doing their jobs, because there was no serious threat from blood sucking wraiths. This was doubly appreciated because all of the repellent that hadn’t been washed off by the river was probably sweated off by now. The humidity and tropical sun were testing our fortitude. At the other end of the path, I groaned. There was another wide section of river. I had been under the impression that one crossing and one short jungle path would get me to the beach. Details, details. No, the guides had not meant to imply that. And “wasn’t this fun? !” I grimaced at them and took the hand being offered to help me balance my first step down another steep bank and into the water. I still shudder just looking at the photo. It seemed we went even less straight across this river. I was informed that it was because the men were aiming for a specific point on the other side, which had not actually been completely decided upon. We started getting into some muddier water, but we also made use of some low-tide islands in various places. The mud and sand on every one of these strange bumps was different, varying from sand, that almost sucked our feet down 6 inches, to slimy clay. Speaking of the tide, it was a little higher than the fearless guides had calculated. Since my girlfriend was shorter than me, I had the advantage of them taking precautions that she didn’t end up neck deep. On the scouting trip, Wild Greg and his accomplice had, from this point, taken one route to the beach and another route home. Now, they began discussing the advantages and disadvantages of these options. Another try past the dogs that tried to bite them? Or more time in the river and a walk down the exotically located runway by a deserted beach mansion?. They ended up choosing a new route when they saw a couple of Costa Rican men fishing from the shore … in the front yard. This was only the second residence we had seen in the dense greenery lining the river. Their house was larger than the first, though the beige-gray stucco still looked worn by the humidity. There was a weedy looking, but short, lawn that segued into an unfenced pasture for a few cows and a horse. Our guides asked if it would be okay if the four of us passed through. Very friendly, though quizzical, approval was granted. As we passed the house, two bulldog-type dogs started to rush us, barking furiously, but the lady of the house quickly stepped outside to control them. I was relieved to see them obey so readily. We walked through the middle of the pastured animals, suddenly realizing we were within a couple arm’s lengths of a horned bull with a ring in his nose. He was lounging, chewing his cud, showing no signs of animosity. A few feet more and we opened (and closed) a barbed wired farm gate to be able to continue down the seemingly country path. We saw a few butterflies. For a second, we might as well have been back in rural Idaho! All at once, the tree lined, grass cover road was gone. In it’s place was a vast expanse of beach, wide and extending as far as we could see into the haze of either horizon. We had run the gauntlet and won the prize. The stifling indefinite quality that time had assumed while we tempted death and dismemberment changed to a heaven-like sense of timelessness. No need to think about the trip back just yet. Isla Dama beach near Quepos in Costa Rica. The only building in sight was a couple hundred feet to our right, the house that accompanied the odd air strip. It had bleach-white walls and a red tiled roof. The house and surrounding patio jutted out from the jungle so far onto the beach that a multi-terraced rock wall had been constructed to protect it from the surf. Not a soul was in sight. We continued on down to the waves and transitioned completely to swimwear. After a luxurious rinse in the ocean, my girlfriend and I sat in the wet sand where the gentle tips of the waves could splash us. The men stayed further out, then hunted completely uncivilized crabs. Wild Greg’s accomplice smoked a hand-rolled Cuban cigar recently purchased at a specialty shop in the nearby town of Quepos. Then, we all sauntered north along the beach, past the eerily empty, but immaculate, house. I thought we would turn around and head back to the resort soon, but crocodile fever was still festering in the men. They headed us toward the mouth of the river. With now having spent more than 2 hours in the sun, it was beginning to feel like a torch being held over my shoulders. I took my sweaty tank top out of my clothing bundle and draped it across my shoulders. This covered more of the tender areas than wearing it would have. The search for a crocodile was in full force. Along the way, we found a group of 50 or more tide pools carved out of the sand by the action of the ocean. The water in them was hot tub steaming. Wild Greg lay down in one of the deeper ones, covered to his neck for half a minute. I could barely stand to walk through them. Here, too, there were crabs under ultra thin layers of sand, crouched near the waterlines of the temporary ponds. When disturbed, they came out fighting. Certain intrepid crabbers could not find any place to pick up the crabs where the fluorescent blue claws could not reach. In the final rounds, the crabs fought a footless pair of sandals. The crabs never surrendered, but were released alive, possibly chewing (or whatever crabs do) on some newly donated finger skin. At the mouth of the river, there were no crocodiles that could be seen in spite of the swampy looking lagoon that bulged out to one side. So there were choices to be made. The ever optimistic guide/hunters decided in favor of new territory, so we rounded the point of the small peninsula, which was searing hot and made the air directly above it glimmer. On the river side again, we began to hike on a slanted muddy bank littered with dead, flattened rushes. My girlfriend was showing signs of fatigue, but took the lead in the determined way of one shortening the journey by shear will. Until she remembered the snakes. At her request, her husband took the lead as the snake detector. Much to his disappointment, we never came across a snake. I was skeptical when the guides advised “more river time” in order to proceed in the straightest line possible to our destination, the resort. Upon taking 5 seconds to survey the curves of the shore and jungle hanging down the banks into the water, we women had to admit it made sense. It sounded better than 3 more hours of hiking. We would probably be hiking at least another hour as it was. It was beginning to feel like a “death march.” The drinking water was depleted. Our legs were turning to jello from the liquified terrain. The adrenaline was way past helpful. Chris and Adam ahead of us on what we are assured is the home stretch. I am past feeling hopeful at this point. In and out of the water we went, again making some use of those soggy low-tide islands. Once, in knee deep water where the dirt had been stirred up from those in the lead, a two foot long, creepy looking fish swam right next to me. I let out a scream, short but intense and loud. It was noted by Wild Greg, that of course the fish would swim close to me. However, in spite of more river crossings, we never managed to scare up a crocodile. Thank God. Ironically, it was us women who ended up leading the men on their first successful Costa Rican crocodile hunt two days later. We wanted to go tour another resort we had seen when driving to a different beach the day before. Inside the grounds of this resort there was a natural lagoon. As the resort manager showed us around and past the lagoon, he complained that they had not been able to get rid of all the crocodiles there. Wild Greg and his accomplice headed right down to the water’s edge and spotted a meter long crocodile. I believe I have now fully earned my crocodile hunter badge.